Photometric measurement of ground-level fugitive dust emissions from open-lot animal feeding operations. Fugitive dust from confined livestock operations is a primary air quality issue associated with impaired visibility, nuisance odor, and other quality-of-life factors. Particulate matter has conventionally been measured using costly scientific instruments such as transmissometers, nephelometers, or tapered-element, oscillating microbalances (TEOMs). The use of digital imaging and automated data-acquisition systems has become a standard practice in some locations to track visibility conditions on roadways; however, the concept of using photometry to measure fugitive dust concentrations near confined livestock operations is relatively new. 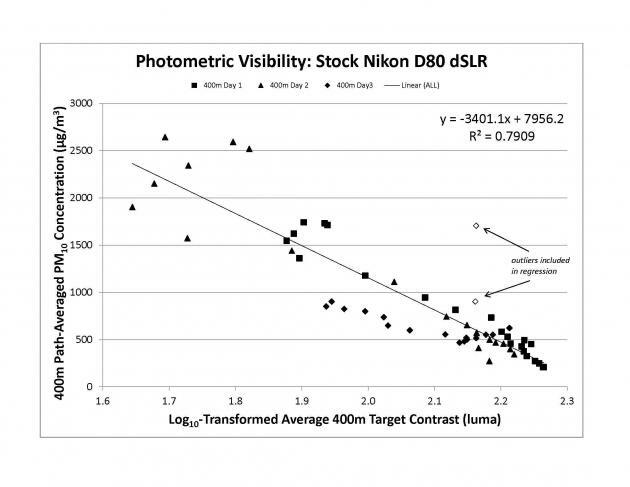 We have developed a photometric method to estimate path-averaged particulate matter (PM10) concentrations using digital SLR cameras and high-contrast visibility targets. Digital imaging, followed by automated image processing and interpretation, would be a plausible, cost-effective alternative for operators of confined livestock facilities to monitor on-site dust concentrations. We report on the development and ongoing evaluation of such a method for use by cattle feeders and open-lot dairy producers. To develop a low-cost practical alternative for measurement of path-averaged particulate matter (PM10) concentrations downwind of open-lot animal feeding operations. 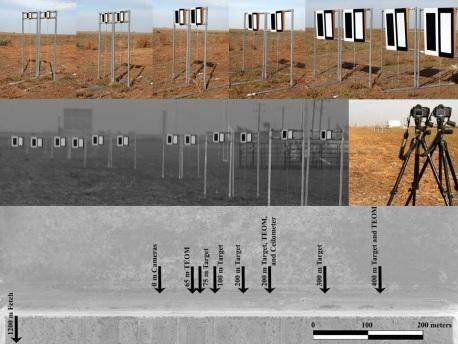 Working downwind of a cattle feedyard under a variety of dust conditions, we photographed an array of high contrast visibility targets with dSLR cameras and compared contrast data extracted from the photographs with path-averaged particulate matter (PM10) concentration data collected from several TEOMs codeployed alonside the visibility targets. We have developed a photometric method to estimate path-averaged particulate matter (PM10) concentrations using digital SLR cameras and high-contrast visibility targets. Using contrast data from digital images we expect to predict PM10 concentrations within 20% of TEOM values under the dustiest conditions. Digital imaging, followed by automated image processing and interpretation, may be a plausible, cost-effective alternative for operators of open-lot livestock facilities to monitor on-site dust concentrations and evaluate the abatement measures and management practices they put in place. We intend to improve the prediction accuracy of the photometric method and automate it such that it can be easily adapted for use as a cost-effective alternative for measuring path-averaged particulate matter (PM10) concentrations at cattle feedyards and open-lot dairies. Sharon Preece, Senior Research Associate, Texas A&M AgriLife Research; Brent W. Auvermann, Professor of Biological and Agricultural Engineering, Texas A&M AgriLife Research; Taek M. Kwon, Professor of Electrical and Computer Engineering, University of Minnesota-Duluth; Gary W. Marek, Postdoctoral Research Associate, Texas A&M AgriLife Research; Kevin Heflin, Extension Associate, Texas A&M AgriLife Research; K. Jack Bush, Research Associate, Texas A&M AgriLife Research. Please contact Brent W. Auvermann, Professor of Biological and Agricultural Engineering, Texas A&M AgriLife Research, 6500 Amarillo Boulevard West, Amarillo TX, 79106, Phone: 806-677-5600, Email: b-auvermann@tamu.edu. This research was underwritten by grants from the USDA National Institute on Food and Agriculture (contract nos. 2010-34466-20739 and 2009-55112-05235).